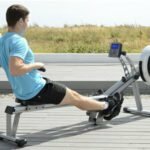 Does The FluidRower Pacific Challenge AR Fluid Rower Provide The Relaxing Experience Users Expect? 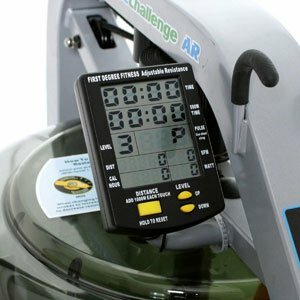 There was a time when one type of water rower ruled the market, but now there is the FluidRower Pacific Challenge AR Fluid Rower to try and provide a little competition. 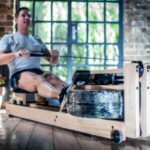 This brand works along the same basic principles as those other wooden water rowing machines that we came to love. There is the promise of a better, smoother action as the resistance of the water in the tank provides a more realistic motion. There is also the fact that this is power-free for a more zen experience. This FluidRower may not be quite as attractive, but it still promises a good performance. Is this the case, or could it do more to impress? 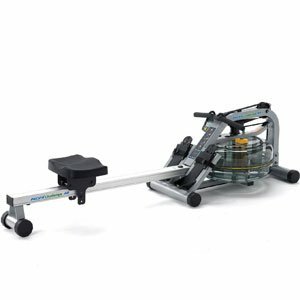 What benefits have users noted in their reviews for this Pacific Challenge AR Fluid Rower? One of the first things that is noticeable with the feedback for this machine is the idea that this is “a joy to use”. There are many people that love using this rower, more than some had first expected to, and this is down to the ease of use and the water. The water in the tank provides a rhythmic noise that add to the rhythm of the strokes. There is also fluidity to the movement and consistency in the resistance. Even so, there is plenty of opportunity to adjust that resistance where needed to increase the intensity of the workout. The different levels provide a challenge for those that may get a little lazy and complacent listening to the water on the lower settings. There is a calming quality here, but there are plenty of helpful features for a more beneficial experience too. There is a small display on the machine that marks calories burned and distance travelled. It is useful, but not so intrusive that it detracts from the experience. There is also the benefit of the transport features and ability for upright storage. 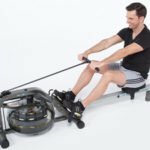 Are there any potential issues with this FluidRower Pacific Challenge Fluid Rowing Machine that buyers need to know about? There are few complaints with this machine because there are so many people that are surprised by the level of the workout and the features on-board. However, there are a few that struggle with the assembly, especially when it comes to fitting the tension on the seat rail. There is another feature to this machine that buyers fail to mention, and that is the connectivity with the USB connection to the laptop. This is designed to enhance progress tracking and data options. The problem is that it adds wires, electronics and distractions to an otherwise simplistic model. The lack of comment suggest that people simply don’t bother with it. Summary: how does this all affect a final recommendation for this FluidRower Pacific Challenge AR? It is easy to accuse the designers of this rowing machine of trying to do to much and over complicating this water rower. The USB connectivity and computer elements aren’t essential with this sort of relaxing rower. However, they are optional and don’t detract from the experience too much. Otherwise, the FluidRower rowing machine is a great idea for anyone looking for a machine with the serenity and simplicity of other water rowing machines and the design and user convenience of more complex exercise equipment. 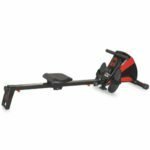 Find out what other people are saying about the FluidRower Pacific Challenge AR Fluid Rower on Amazon here.